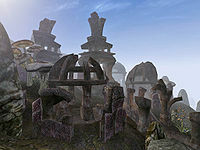 Ald Daedroth is a large Daedric shrine that is located on the farthest island off the eastern coast of Sheogorad and north of Ahemmusa Camp. The shrine features statues dedicated to Azura, Malacath, Mehrunes Dagon, Molag Bal, and Sheogorath. You may visit this huge shrine during three quests. In the Main Quest, you must make the shrine "safe" for the Ahemmusa Ashlanders' migration. Regardless of how you decide to perform that quest, you will have to kill many worshippers, but killing the ordinators is optional. There are a few Daedra scattered about the shrine, including a Golden Saint. The various shrines have numerous offerings of gemstones, ingredients, and various other treasures. However, some of the items are cursed, and will summon a dremora lord when taken. The chest in the Inner Shrine is similarly cursed. Free sujamma is offered in the Antechamber by a scamp called Lustidrike. According to the "leader" of the worshippers, Hlireni Indavel, the warring within the Shrine's halls (which seems to have begun well before you get there) is all a dance. She will ask you whether you are a Spectator, simply watching the fighting (although this is virtually impossible as you are almost constantly attacked); a Game Piece, joining the fight; or a Player of the Game, challenging her personally. While Hlireni does not seem bothered by whose side you're on, considering it all a party in Sheogorath's honor, she remarks that "the ones in the gold masks are party crashers, but all are welcome to the Mad God's Masque and Bellicose Ball", and seems completely indifferent as to who wins in the end and whether she lives. The same cannot be said of the other worshippers, who will attack you on sight (although you can always use a Calm spell). You will find the Ring of Sanguine Green Wisdom on Gnaw Tooth, and the Belt of Sanguine Smiting on Domba in the Right Wing of the shrine. In the Antechamber, if you give Ra'Gruzgob some moon sugar (which can be found in that very room) in exchange for a 'little secret,' he informs you he hid something under his pillow. Beneath that very pillow is the glove Gambolpuddy. Two characters here, Je Tee and Kar Alber, represent developer Gary Noonan and his girlfriend, respectively. Their names are a minor Easter Egg.